Because my time is severely limited as an adult, I often find myself applying or touching up my makeup on the go. If it doesn’t happen in the morning at a mirror, it is definitely happening on a train, in the back of a cab or anywhere that I can sit and balance my purse on my lap really. That means that portability and ease of use are essential features for most of my go-to beauty choices. This is why I was pleasantly surprised at the discovery of the tre’Stique brand in the selection of products from my DIY Makeup swag bag I recently received. tre’Stique is a fairly new beauty brand “offering alternative everyday beauty routine, wherever life takes you.” Please and thank you beauty gods. Here’s the low down on tre’Stique; what they offer, how it works and why I think it’s great or not so much. Everything from tre’Sitque is done in cute dual-ended sticks with interchangeable parts. All packaging is designed to look like chubby crayons without tops. My weakness for packaging is so real and for some reason the packaging tapped into my childhood nostalgia of holding a handful of colored pencils. Packaging is sealed with a custom magnetic cap, so the chances of things opening and smudging in your purse or makeup bag or minimal. So much yes!! This baby has a great color and the texture was fantastic. The color payoff was also wonderful without being too dense. My only issue is that it is the only shade and it was barely deep enough for me to use. I’m a pretty middle-of-the-road shade of brown, so it’s a little crazy for the only bronzer shade offered by a brand to be only as deep as my skin tone. They will definitely need more shades for this stick. Includes contour brush on opposite end of stick. Available in 1 shade. Easily one of my favorites from what I received. One side has a highly pigmented matte lip color and the other a semi-sheer shiny balm. The balm can be used before the matte lip color to moisturize and prep the lip. It is a great moisturizer including ingredients like cocoa butter, tahiti butter, peach oil and olive fruit oil. It can also be layered over the matte lip color to create a shiny finish. The matter lip color is highly pigmented and it wasn’t so matte that it dried out my lips and having the balm readily available makes it easy to moisturize lips if they do begin to dry out. Available in 6 shades, all of which I need! A highly pigmented shadow that is blendable and crease-free, buildable and a long-wearing 12 hour formula. Say what? Run that back! A highly pigmented shadow that is blendable and crease-free, buildable and a long-wearing 12 hour formula. Feel free to whip and nae nae…I’ll wait. Includes a shadow smudger on the opposite end. I’m all for a little smudgey wudgey, effortless smokey situation. Ayyyeee! Convenience is always a great feature. Available in 6 shades. Tinted Face Stick: Only available is 6 shades that do not really meet the needs of women of color. They have an amazing opportunity to gain brand loyalists with women of color if they provide deeper shades. Concealer Crayon: Only available in 3 shades. A wider shade range is definitely needed. Opposite end includes concealer blender. Blush Stick: 2 shades only. Once again I think an expansion of colors is needed, but the current colors are still promising. Opposite end includes contour brush. Eye Pencil: Gel liners offered in 3 shades. Opposite end includes sharpener and mini-smudger. Brow Pencil: Triangle-shaped tip, which sounds like it would make great hair like strokes of color. Other end includes tinted brow gel. A very cool and innovative refillable tool system for pencils. You can easily twist on or twist off the offered interchangeable parts to individually customize your pencils. 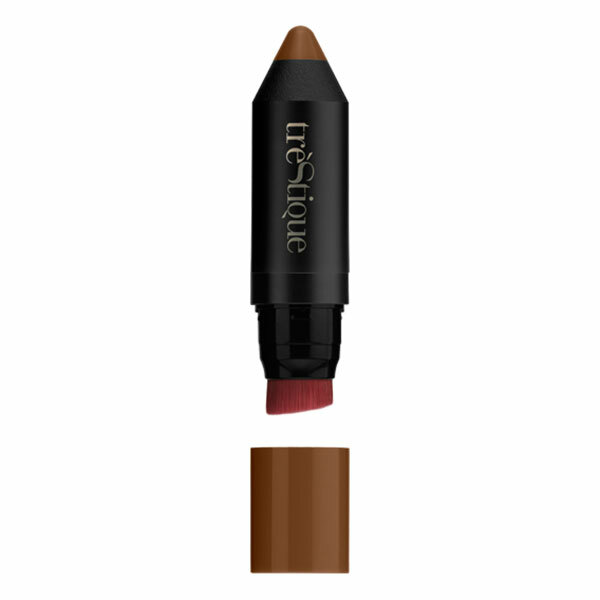 For example, instead of balm, you can have your matte lip color paired with a lip brush. Overall I love the tre’Stique concept and the quality of products was stellar. They really are offering something truly innovative with their cute, but practical packaging. My only issue is the lack of complexion products to meet the needs of women of color. It is very difficult as a woman of color to support a brand that seems to have forgotten that you exist. The addition of deeper shades would definitely put tre’Stique into a makeup bag must have category. I will go ahead an give my stamp of approval, because they are a fairly new brand and I expect that there will be more products added. Find out more about the brand and purchase products here.